In rare situations, your Mac may spontaneously restart, turn off, display a message "You need to restart your computer…", or become unresponsive, indicating a kernel panic has occurred. For similar symptoms in OS X Mavericks, see, "OS X: When your computer spontaneously restarts or displays "Your computer restarted because of a problem." This message may appear: "You need to restart your computer. Hold down the Power button for several seconds or press the Restart button." This message may not appear and the Mac may become unresponsive. The Mac will spontaneously restart. If there are five new kernel panics within three minutes, the Mac will display a prohibitory sign for 30 seconds, and then shut down. If this happens, skip to the "Troubleshooting a recurring kernel panic" section of this article. 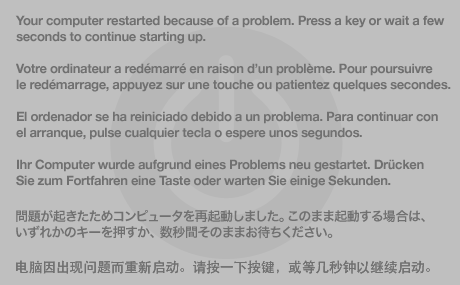 If the kernel panic does not occur at startup, this message appears for a few seconds: "Your computer restarted because of a problem. Press a key or wait a few seconds to continue starting up". You will then see the Apple logo and spinning gear as your Mac begins to start up. 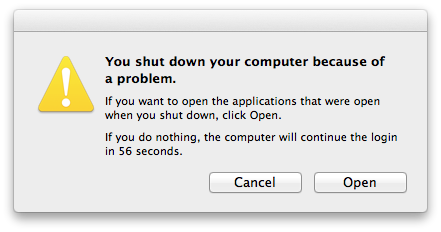 This message will display for 60 seconds: "You shut down your computer because of a problem." Click Open to open the applications that were active at the time of the kernel panic. After logging in you will see a dialog informing you that "Your computer was restarted because of a problem." 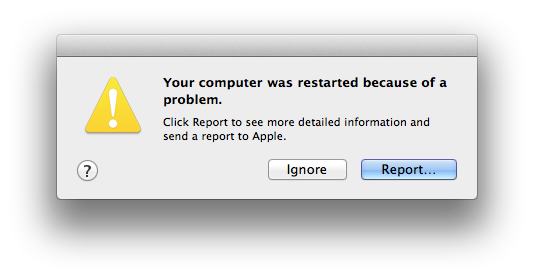 Click "Report…" to see details of the kernel panic. Click OK to send the report to Apple. Important: If you find the term "machine check" in the "Problem Details and System Configuration" field, skip to the "Troubleshooting a recurring kernel panic" > "Hardware Troubleshooting" section of this article. 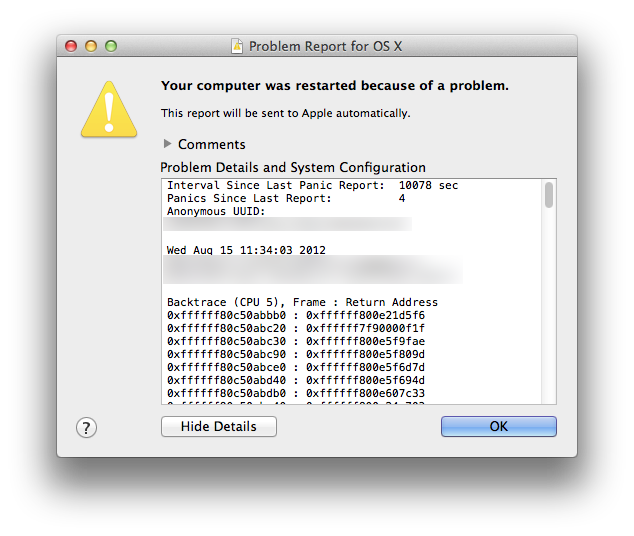 In most cases, kernel panics are not caused by an issue with the Mac itself. They are most likely caused by an issue external to the Mac. If the kernel panic doesn't happen again within a few weeks, you don't need to troubleshoot further. To help avoid kernel panics, install all available software updates until Software Update reports "Your software is up to date". OS X updates improve the tolerance for external issues such as malformed network packets and so forth. For most kernel panics, updating your software is all you have to do. Press and hold the Power button for several seconds to turn off your Mac. As soon as your Mac starts up, hold down the Shift key to start up with a Safe Boot into Safe Mode. Note: If you are using a third-party external keyboard and cannot start with a Safe Boot, try using an Apple keyboard instead. If your Mac has another kernel panic starting up, or while in Safe Mode, go to the "Troubleshooting a recurring kernel panic" section below. 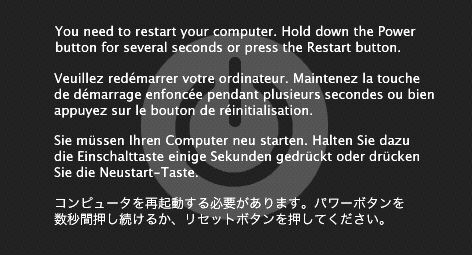 If your Mac starts up without a kernel panic after a Safe Boot, restart by choosing Apple menu () > Restart…, then let it start up normally. Important: If the Mac has another kernel panic within a few weeks, refer to the "Troubleshooting a recurring kernel panic" section below. Note: If the hardware and software on the Mac checks out as OK, yet recurring kernel panics still occur, it is possible that something on the network is sending the Mac malformed network packets. In these situations, check the devices on the network. Make sure the router's firmware is up-to-date, and that the router is functioning. Refer to the router's manufacturer for service and support. Diagnosing a recurring kernel panic can be difficult. If you would like to avoid this process, or do not know how to perform any of the following steps, consider bringing the Mac to a Genius at an Apple Store or an Apple Authorized Service Provider for assistance. Be sure to ask that, if the drive needs reformatting or replacing, they contact you about escalating your case to a special data recovery service. If you plan to visit an Apple Retail store, make a reservation at the Genius Bar using http://www.apple.com/retail/geniusbar/ (available in some countries only). Is the kernel panic intermittent, or does it happen every time you do a certain thing? Start the Mac from Recovery or its install media. Note: If a kernel panic still occurs, go to the "Hardware troubleshooting" section of this article. Open Disk Utility and use "Repair Disk" on Mac's internal hard drive (named Macintosh HD by default). Important: If Disk Utility is unable to repair the internal drive, you should bring the Mac to a Genius at an Apple Store, or an Apple Authorized Service Provider for service and support. Be sure to ask that, if the drive needs reformatting or replacing, they contact you about escalating your case to a special data recovery service. If you plan to visit an Apple Retail store, make a reservation at the Genius Bar using http://www.apple.com/retail/geniusbar/ (available in some countries only). Connect an external drive with at least 10 GB of free space. Note: Make sure the external drive does not cause kernel panics and is the only device on its USB, FireWire, or Thunderbolt port. Connecting the external drive and its cables to another Mac can help make sure the drive does not cause kernel panics. Install all software updates until Software Update reports your software is up to date. Use the Apple applications on the external drive to surf the web, view QuickTime movies, email, print, scan, and/or other activities. Continue using the Mac for the amount of time it would usually take for the kernel panic to occur. If a panic occurs, go to the "Hardware troubleshooting" section of this article to further diagnose the issue. If a panic does not occur, go to the "Software troubleshooting" section of this article to further diagnose the issue. If a kernel panic does occur: Bring the Mac to a Genius at an Apple Store, or an Apple Authorized Service Provider for service and support. Be sure to ask that, if the drive needs reformatting or replacing, they contact you about escalating your case to a special data recovery service. If you plan to visit an Apple Retail store, make a reservation at the Genius Bar using http://www.apple.com/retail/geniusbar/ (available in some countries only). Start the Mac from Recovery or its install media that came with your Mac and reinstall OS X on your Mac. Run Software Update and install all updates until Software Update reports "Your software is up to date." Start the Mac from Recovery or its install media that came with your Mac. Note: Avoid copying data from the /Library and /System directories on your backup disk image. Information that may aid developers in the investigation of a software issue may be in the log. The information may also provide a clue as to what event may have caused the kernel panic in the first place.